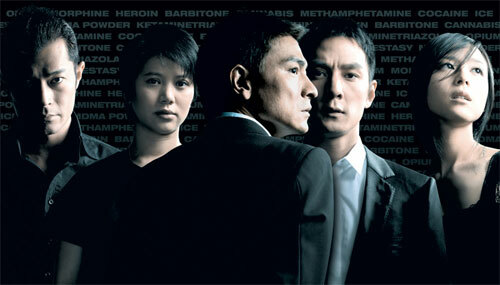 From left to right: Louis Koo, Anita Yuen, Andy Lau, Daniel Wu, and Zhang Jingchu. The Skinny: Don't do drugs, and for God's sake, don't sell them either. Protégé tells a familiar, even hackneyed story in powerful style. The characters could use further development, and the film occasionally loses focus. Still, thanks to director Derek Yee, this is quality Hong Kong Cinema. Hong Kong Cinema gets a shot in the arm - both literally and figuratively - with Protégé, a powerful drug drama directed by Derek Yee, who was last seen slumming with the routine romantic comedy Drink-Drank-Drunk. Protégé brings Yee back to his strengths, telling a detailed and thoughtful narrative in riveting, emotional style. The themes in Protégé are nothing new, and how could they be? We live in a global community, and by now everybody has (hopefully) seen Traffic, be it the BBC drama or Steven Soderbergh's Oscar-winning film. Yee brings a similar tale to Hong Kong, and he does so in a way that creates an immediate emotional response. Protégé prods its audience to feel and react, something that a successful motion picture probably should do. However, Yee doesn't fully develop his screenplay and characters, sometimes letting them suffer behind the grand anti-drug message. Still, it's all - or at least mostly - good. Telling us not to do drugs is usually a boring message, but in Protégé that message is most definitely felt. Andy Lau stars as Kwan, a successful businessman and family man who also happens to be Hong Kong's top drug lord. However, the years have taken their toll on Kwan; he suffers from diabetes and is looking to retire. But he's just appointed a successor: Nick (Daniel Wu), who has managed Kwan's drug handlers for years with expert efficiency. It looks like a good move, as Nick seems more intelligent and able than Kwan's other partners. Unfortunately, Kwan is a lousy judge of character: Nick is really a cop, having spent seven years undercover to ferret out Kwan's heroin operation. Progress has been slow; Nick doesn't know where the drugs come from, or where they're made, and Kwan is reluctant to show anyone. But Nick's appointment to Kwan's heir comes with a full initiation into the druglord's empire, from the laboratory all the way back to their source in the Golden Triangle. With each step, Nick comes closer to finishing his undercover assignment and putting Kwan and his operation out of commission. However, each step also brings Nick closer to betraying a man whose trust he's earned. Where do Nick's loyalties truly lie, and will he find the guts to put away Kwan once and for all? Protégé proffers an expected complexity with its iconic "undercover cop with divided loyalties" plotline, but the film eschews Hard Boiled/Infernal Affairs riffs for something that sounds less exciting: education on the local drug trade, with a gray-haired Andy Lau as the tour guide. Once Nick is tapped to succeed Kwan, he gets the full-on tour, first checking out the local "kitchen", where they cook the goods, plus he meets the warehouse manager, and finally visits the poppy fields in Thailand where the stuff is originally grown. Throughout this process, we get a constant educational earful, which includes info on how they cut the merchandise, how they move it, how the business is doing (heroin is down, but Ecstasy is up) - basically the complete picture on running your own successful drug empire. According to Kwan, the trick is strict separation of tasks. Manufacturing, storage, and delivery are handled separately, and the three should never meet. Security is one reason for this setup, but another is it makes the business into what it is: a business. As Kwan notes in an acidic monologue, the drug trade is just a business to him, and the consequences (addiction, crime, degradation, dead people) are not his problem. But it is Nick's problem - or, he chooses to make it such. Protégé begins at the end of its narrative, with a post-undercover Nick ruminating on why people take drugs in the first place. The film does deliver an answer to Nick's existential query, though it's rather compact and could easily be the tagline for a 12-step course on beating addiction. The film's exploration of its topic is rich and affecting, however. Aside from hanging around with Kwan, Nick also chances into a relationship with Fan (Zhang Jingchu of Seven Swords), a single mother whose heroin addiction threatens to consume her. Nick at first abhors her drug addiction, spurning her when she's most desperate, but soon he tries to understand and even care for her. The experience puts his relationship with Kwan in question. Despite his lingering respect for his (crime)boss, can Nick forgive Kwan for his complicity in Fan's troubles? Protégé gets more mileage out of this conflict - Nick the witness to addiction vs. Nick the fledgling drug lord - than the undercover cop/criminal duality that one may expect after reading the film's synopsis. The two plotlines also comprise both ends of the drug trade - the dealer and the addict - giving audiences a panoramic view of the film's sometimes overemphasized anti-drug message. Yes, we get that drugs are bad. Do the filmmakers have to remind us so often? Maybe not, but given the film's transparent aims, it seems that they want to. Protégé's themes are rather commonplace and even trite, and the underdeveloped and sometimes mishandled characters only add to the potential for a public service announcement overdose. Nick is remarkably naive for a cop who's been undercover for seven years, and seems to express his tortured existence in an external, rather than internal manner. Given his frequent reactions of shock or disapproval, one wonders how he was able to ingratiate himself so far into Kwan's circle of trust without drawing extra suspicion. Kwan is also problematic; the character possesses a believable humanity, and his ruthlessness and denial is something Andy Lau effectively conveys. However, the film neglects to fill in one blank in its exploration of the Hong Kong drug trade: how does a smart family man like Kwan get involved in such a horrifying, morally bankrupt biz? Given how much we learn about the ins and outs of the whole drug trade, that nugget of info seems to be a missing piece. Louis Koo's character is also a misstep. The Tanned One plays Fan's loathsome husband, who supposedly spread his heroin addiction to her. Koo strains valiantly in the role, dirtying his looks and even wearing a set of false teeth to appear less handsome than his usual dashing screen image. However, the character never develops beyond a caricature of a drug addict, and Koo's jittery overacting sometimes elicits laughs. If the point of the character was simply to cast an actor against type, then the filmmakers succeeded, but otherwise the character is handled poorly - especially when it comes time to decide his fate. The filmmakers step outside of reality and deliver a coda to the character that may please justice-seeking audiences, but it also feels inherently false. At times Protégé doesn't seem to know what it wants to be. Is it an uncompromising drama? A cop-criminal thriller complete with crowd-pleasing justice? Ironic commentary on the ineffectiveness of law enforcement? Or an existential exploration of man's emptiness, which the film suggests causes and enables substance abuse? There's a lot going on in Protégé, and it doesn't all tie together neatly. But Derek Yee is at the helm of this film, and that can only be a good thing. Though the screenplay sometimes seems unfocused, Yee ties things together with compelling cinematic finesse. Yee changes up his technique frequently, sometimes going for edgy and stylish, and other times using subtle details to foreshadow later horrors. The content is really nothing new, but that's fine. Derek Yee has never been a filmmaker to offer new themes or unique characters, but his handling of generic material may be stronger than any Hong Kong director currently working. Films like 2 Young and Lost in Time succeeded in large part due to their copious detail on everyday life. Protégé isn't about everyday life, but the details it offers on the drug trade are eminently interesting. Nick's initiation into Kwan's world feels fascinating and complete, the didactic portions of the film managing to involve and entertain as much as they educate. Derek Yee has a knack for making explanation into entertainment, but he doesn't forget to deliver the occasional knockout blow. During one harrowing sequence, Nick is cornered by customs cops (led by an overacting, but very effective Liu Kai-Chi), and must either help the rival cops or his undercover drug-trading brethren. The subsequent raid on the "kitchen" is amazingly intense, mixing black comedy and surprising violence into a harrowing and hyperemotional sequence that affects long after the film ends.